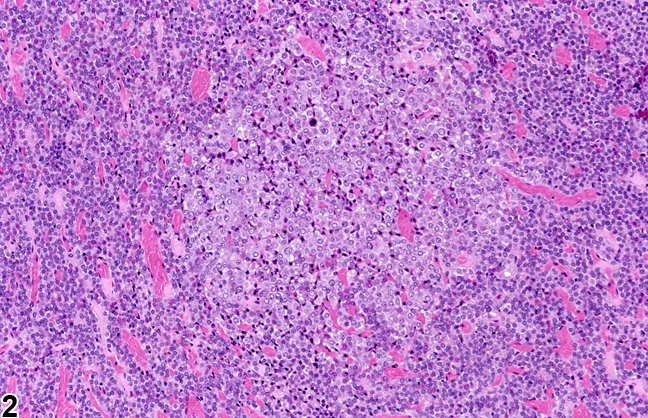 Pituitary Gland, Pars distalis - Hyperplasia in a female Harlan Sprague-Dawley rat from a chronic study. 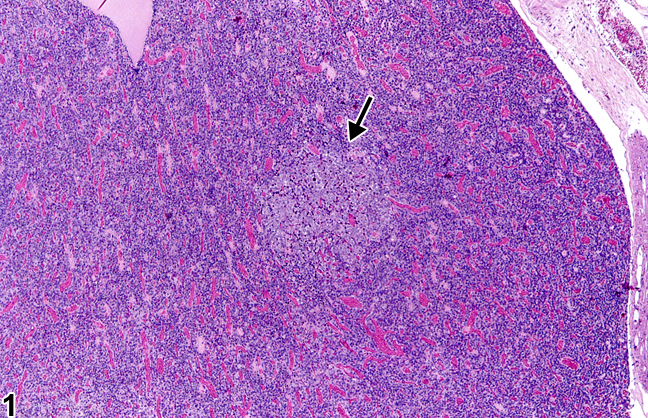 A small focus of hyperplasia (arrow) in the pars distalis is recognized by the paler staining cells. 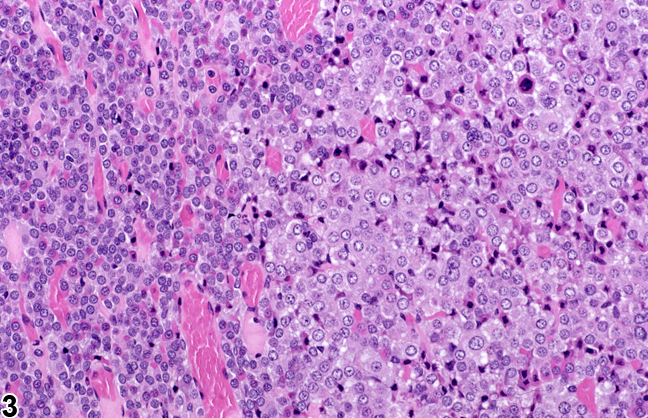 Pituitary Gland, Pars distalis - Hyperplasia in a female Harlan Sprague-Dawley rat from a chronic study. 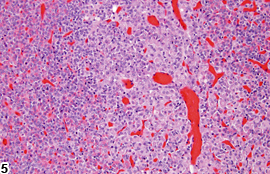 Higher magnification of Figure 1 shows the focus of hyperplasia in greater detail. 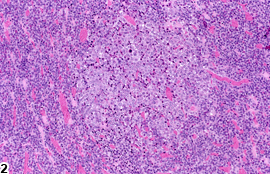 Pituitary Gland, Pars distalis - Hyperplasia in a female Harlan Sprague-Dawley rat from a chronic study. Higher magnification of Figure 2 highlights the larger, paler staining cells in this focus of hyperplasia in the pars distalis. 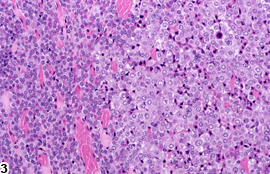 Pituitary Gland, Pars distalis - Hyperplasia in a female Harlan Sprague-Dawley rat from a chronic study. 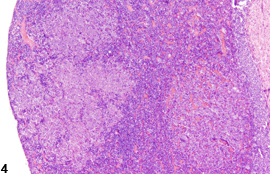 Multiple focal areas of hyperplasia consisting of paler staining cells compared with the surrounding parenchyma are present in the pars distalis. 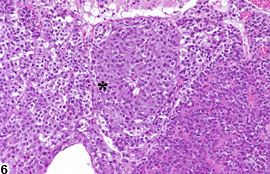 Pituitary Gland, Pars distalis - Hyperplasia in a male F344/N rat from a chronic study. The focus of hyperplasia consists of paler staining cells (compared with the surrounding normal parenchyma) and dilated blood-filled vascular structures which are consistent with minimal to mild angiectasis. 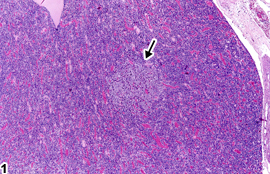 Pituitary Gland, Pars intermedia - Hyperplasia in a male F344/N rat from a chronic study. 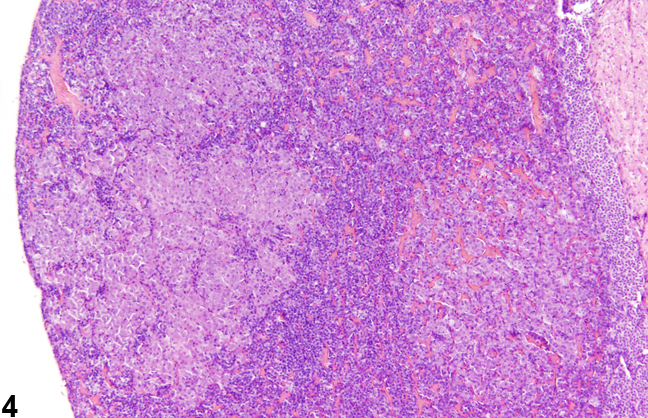 This example of hyperplasia of the pars intermedia (asterisk) is characterized by a circumscribed focus of cells with abundant amphophilic cytoplasm without compression of the adjacent normal parenchyma. 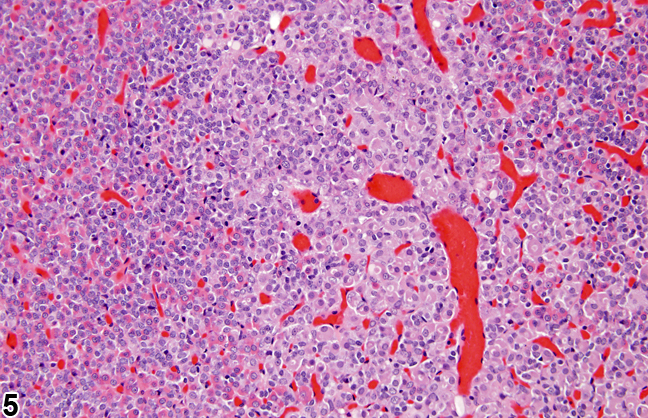 Pituitary Gland, Pars intermedia - Hyperplasia in a male F344/N rat from a chronic study. Higher magnification of Figure 6 shows that the hyperplastic focus in the pars intermedia is characterized by a circumscribed collection of cells with abundant amphophilic cytoplasm without compression of the adjacent normal parenchyma.